This was another week chock-full of firsts and changes. First up, Josie may or may not have said her first word.... and given her partiality towards other little babies, it was rather unsurprisingly "baby" - or "dadey!" if you're Josie ;) It may have just been a fluke (since she hasn't repeated it since), but she immediately said "dadey" as soon as I showed her a book with babies on it, and then she said "dadey!" 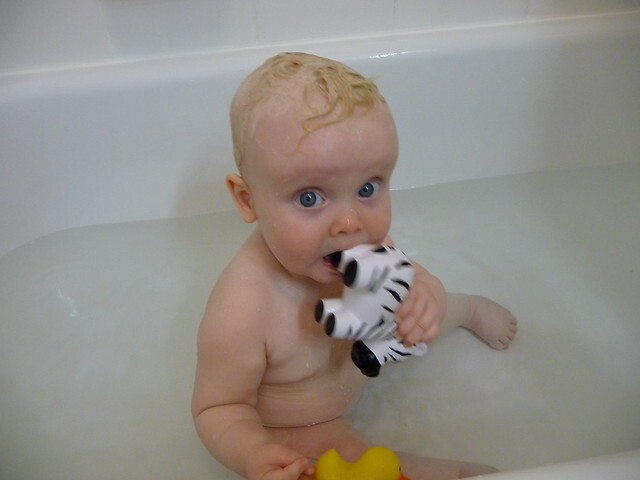 each time I said "baby" to her... so the consonants are a bit off, but the vowels and intent may be there. She also said "mama" and "daddy" pretty clearly this week, but not actually in connection with me or Ryan, so I don't think those count yet. Josie is also getting into a routine now as we leave daycare, so she'll wave to everyone there, and then pop her thumb at them... and then we all clap together since she's so cute :) She likes to clap while I'm trying to get her to sleep though too, which is still cute but a little bit less so with that timing. 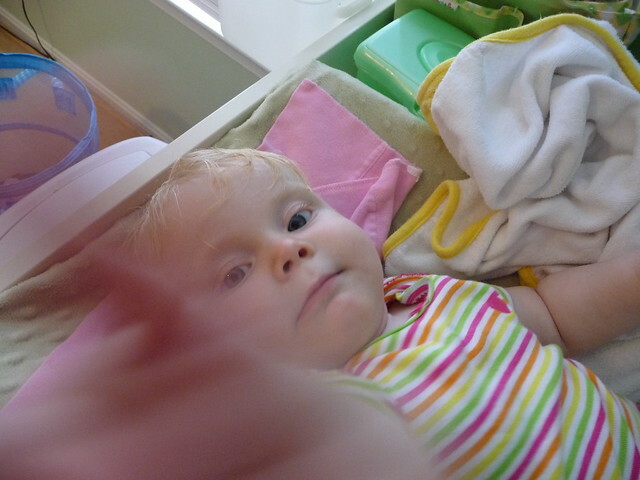 Speaking of sleep, we ended up transitioning her back into her crib (for the most part) last week. Between all the rolling and arm flailing, my sleep began suffering more, so we reconfigured the crib/bed situation (since there's nothing we like better than taking apart that crib it seems - I think this was the third time?) to more safely sidecar the crib onto the bed than it had been previously. So now the crib mattress is right up against our mattress (with no gap like there was before), with the bed rail separating our mattresses - that way Josie can roll around without waking me up, but she's still close enough for me to comfort her easily if she wakes up, and she can also more safely stay in bed in case I fall asleep during the overnight nursing sessions. We also thought this would be a timely transition, since she is moving around more now and I was basically trying to box her in to keep her still when she was in bed - and although the first couple of nights were a bit rough, I think she likes being able to move around more now, since she seems to far prefer sleeping on her side or tummy now and is very rarely on her back anymore. As far as mobility progress, this week Josie pulled herself to standing in her crib at daycare, which is good that it happened there, since knowing that she's capable of that ahead of actually witnessing it myself gives me time to prepare so hopefully I won't freak out the first time she does that here ;) I'm going to have a rough time once she's a toddler, since my heart still drops every time she's not exactly where I left her. She's also starting to pull herself forward more and scoot around a little bit on her bum - not in the most coordinated method (as when she pushes herself backwards but insists on keeping her hands still, so she ends up lying on her face on the floor, or when she pulls herself forward (usually by my hair), but doesn't know what to do with her legs so she ends up doing the splits), but it's still something. 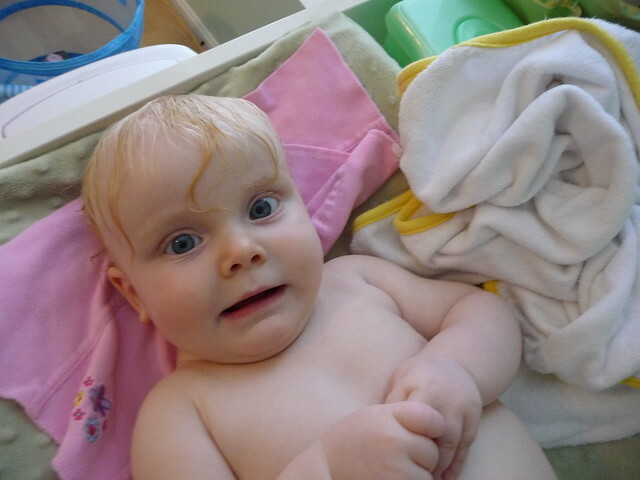 Also, believe it or not, Josie just this past weekend had her first "big girl" bath. 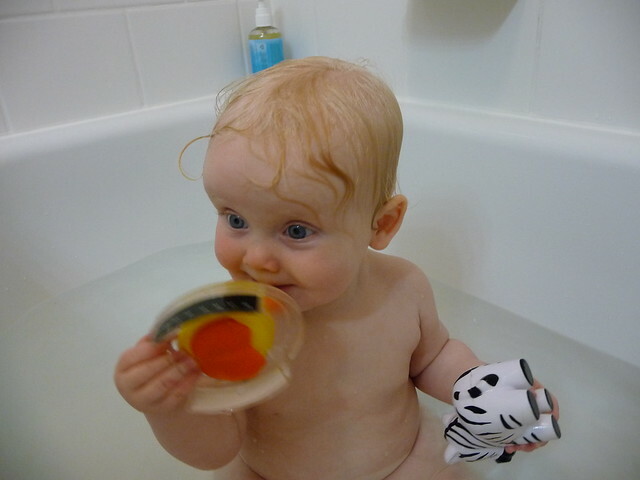 We used the infant bath her first few weeks, but ever since then have just been taking her in the shower with one of us - she likes it (since she gets to try to catch the water with her mouth and/or hands), and it's quicker and easier for us. But I felt we were remiss in denying her the opportunity to splash around in a bathtub, so I decided to remedy that situation last weekend. She seemed to be a fan, although she spent more time gnawing on her toys than splashing (which is probably for the best), and then cried when I finally took her out (once the water was almost cold and had far too much spit up in it). 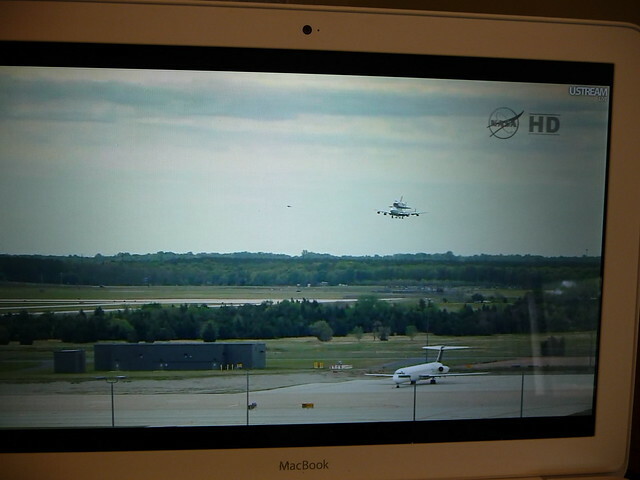 And in not-really-baby-related news, there was some excitement in the area this week with the shuttle Discovery being flown up from Florida to its final retirement home at the Udvar-Hazy museum. The shuttle program was officially concluded in Josie's lifetime (although obviously much too early for her to ever have any memory of it! ), and who knows if it might be reinstated in the future, but I still wanted to mark the occasion. And I'm afraid I made a complete ridiculous mess out of it - I knew the shuttle would be flown in (on the back of a 747) to Dulles airport at some point Tuesday morning, but I was working from home that day and didn't feel like dealing with parking, etc., to drive to the museum or airport. So I basically forgot about it until I was on a call with legal counsel from work, and he said he needed to go see the shuttle and he would call me right back. I was very confused by this, seeing as how we don't work at the museum or airport. 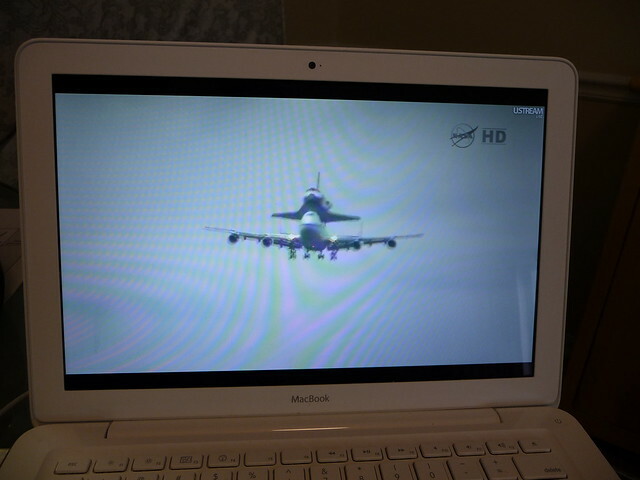 So I bring up the streaming video of the shuttle just in time to watch it land at the airport... come to find out later, it had made multiple passes around the area, so instead of watching it on the computer, I could have gone to work (where it apparently passed directly overhead)... or to the highway by the airport... or likely even just outside my house. Instead, I stayed inside, and even worse, I took a picture of my laptop to remember the occasion, since I insist on forgetting that I can just take a screenshot. Sigh. Yes Stacey, if you had walked out on your deck you would have seen it fly right over your head. It was breathtaking!